The attack by Turkey on the Kurdish enclave of Afrin in northern Syria looks more like a tactical victory than yet another instance of Turkish President Recep Tayyip Erdogan’s impishness. The Russian moved into Afrin months ago, during the siege of Aleppo to keep Turkey from allowing rebels to be resupplied. They pulled their forces out before the attack. The Turks have been massing in the area in preparation for an assault. Reports exist of Turkish forces firing at U.S. troops embedded with the SDF and not firing back. This less than two weeks since the U.S. shot down a Syrian SU-22 for ‘threatening U.S. forces. The SDF is threatening to pull out of its operation to oust ISIS from Raqqa. These are the things we know. Even if the SDF haven’t officially stated they would pull their troops out of Raqqa in the event of a Turkish attack in Northern Aleppo, it’s pretty obvious that this attack was designed to slow down U.S. plans to colonize Syria east of the Euphrates River. With the stepped-up U.S. belligerence against the Syrian Army in recent weeks this move by Erdogan reveals his willingness to use whatever leverage he can against his NATO ally. This is exactly the kind of ‘parallel escalation’ that Russia excels at. Instead of dealing with the U.S. head-on and creating overt tension, Putin has his military pressure the U.S. on a different front. Using the Turks this way serves both strategic and tactical purposes, which is why I think it’s the most likely reason why this attack suddenly started and just as suddenly stopped. Now, everyone involved is under no illusions about what the stakes are. The U.S. cannot hold onto both Turkey as a NATO member and have the Kurds do its dirty work with the end goal being to partition Syria while the U.S. builds military bases to threaten Iraq, Iran and Russia. This is a non-starter for Erdogan and Putin. So, it makes perfect sense that they would have discussed this plan beforehand. 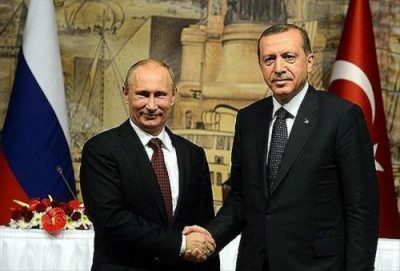 It also means that Putin, who has remained neutral on the Kurdish question, just told them how far he is willing to be pushed before unleashing his attack dog, Erdogan. The Russians just pushed the U.S. military and Deep State into making the choice to give up at least one of these three things or escalate the conflict further. Because the Kurds have made it clear that they don’t trust the U.S. not to abandon them at the end of this. So, now the American counter-move will have to be President Trump authorizing a massive build up in Syria if the Kurds abandon them at Raqqa to support the PKK enclave the Turks are threatening. This move by Erdogan slows down the advance on Raqqa and buys the Syrian Army a little more time to shore up their campaigns to the south before moving much farther east. The front line is too big at this point and needs to be shortened to allow longer supply lines for any assault on ISIS in Deir Ezzor.